Initially, I didn’t like Orzhov very much. The idea of Exort seemed somewhat low-impact at first. Adding one mana to all your spells seemed not worth the issue of making your curve higher. Triggering Extort every turn meant drawing a long string of spells, which very much felt like a ‘win more’ strategy. 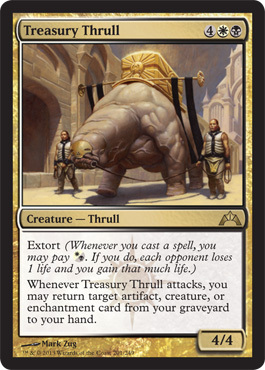 Also, many of the defensive creatures in Orzhov looked as though they would quickly become outmatched by growing Evolve creatures, Battalion-fueled alpha strikes, or turn after turn of Bloodrushed creatures. The truth is that Exort is rather unimpressive by itself. However, what happens when you have two Extort permanents in play? Doesn’t spending two extra mana for a drain or two sound far better? What about three? At some point, an Orzhov deck probably starts to feel like a burn deck, or at least a deck with a fair amount of reach. There are eight common or uncommon cards with Extort in Gatecrash, meaning it’s very possible to build a deck that closes quite effectively without attacking. That said, cards like Kingpin’s Pet (BW1 2/2 flyer with Extort) will be paramount to an effective Orzhov deck. It’s an aggressive flier that isn’t asked to put himself at risk through blocking. Trying to build your entire deck around grinding your opponent’s life down while hiding behind the four toughness ground duders with Extort probably isn’t going to get the job done by itself; the other guilds have too many ways to breach your defenses. Evolve, Battalion, and Bloodrush will all make a 1/4 Defender largely useless once the mid-game arrives. That’s not to say the four toughness men are unplayable. After all, they DO have Extort, and they all help pad your life total, which in an odd way, becomes your defense after you reach a critical mass. I can see some tense racing situations while playing as Orzhov, so remember, every life point except the last one is a resource to be spent. Use it properly, and you will win some seemingly unwinnable games. I chose Dimir to talk about next because I feel like it is uniquely placed among the guilds of Gatecrash. It has a bit of an identity crisis. It has mill effects, some beaters, and some control elements, which can make it tough to build or play. My guess is that at times, Dimir(or Orzhov) will want or need to add the appropriate color to become Esper. The combination of each guild’s keyword is intriguing. When you play a copy of an encoded Cipher spell, you also trigger your Extort effects. If there was a way to play a ‘normal’ control deck in Gatecrash Limited, Esper will be the way to go. This format looks to be light on blocking, especially so when it comes to flying blockers. Any old flyer with a spell encoded on it has a good shot to do serious damage. Playing Dimir by itself can be complex. Ever realize suddenly during a ‘normal’ game of Magic that the possibility of semi natural decking exists for at least one player, and you possibly should have switched gears a turn or two earlier? Be aware of that when playing Dimir, depending on how many incidental milling effects you have. If your initial offense fails, you can always try to fall back on drawing your Mind Grind,Whispering Madness, or random duders that help mill cards, which at some point in a game will become lethal. Mind Grind in particular shines at finishing games. Imagine a turn nine on the draw. Your opponent has naturally drawn 15 cards from their deck, and you milled him for say, six cards with random stuff. He has 19 cards in his deck. Mind Grinding him for seven has a fair shot at ending the game, or at least pushing your opponent to the brink. The best part about the spell is that you usually have a good idea of what a lethal number is. Players rarely hold more than one land to bluff, though savvy ones may hold more if they are flooded and know you can Grind them. The other way to win a game is by Ciphering just about anything multiple times, though this means you are connecting with a guy over and over. I could be wrong on Cipher being enough to dominate a game because Dimir’s creature defenses aren’t that great. Dimir’s removal is excellent considering how rare it is in this format, but given how dangerous almost anything can be from Gruul or Simic, waiting for the right moment is key. Simic is the guild I officially represent according to Plansewalkerpoints.com. I picked them back before Gatecrash was previewed because I liked the Graft mechanic so much(and because their quiz told me I should). Gatecrash has NOT dissapointed me. Evolve is very simple on the surface, but might be the toughest mechanic to master. Measuring risk/reward ratios when deciding whether to play a guy that can later Evolve versus playing something to pump the existing team can create important decisions early in games. Sometimes it will be obvious, but other times the game could easily be decided by which play you make, and it could happen on turn four or five. You’ll have to choose with little information, so letting the right play happen by trusting your instincts will sometimes be the only way to go. A big problem with Simic besides tough choices is just getting your cards in the right order. Many of the most powerful Evolve cards start very small, and have limited board impact in the mid to late game. Ever drawn a Stromkirk Noble on turn six? Yeah, it feels something like that. the last issue I have with Simic is that it doesn’t pair that well with either of it’s partner guilds. Both guilds bring some splashable removal, but their keywords aren’t great. Bloodrush is always nice, but generally your guys are supposed to be bigger anyway. Some of the blue Cipher cards are fine, but everything shy of Shadow Slice(B4 Sorcery Cipher Target player loses 3 life) seems not worth straining a manabase. Then again, Green does have an additional fixer, so perhaps the opportunity cost is low enough after all. Of course, if everything goes right, if you open a solid pool and curve out often, you will feel unstoppable. And you very well may be. Simic can have those kinds of draws. 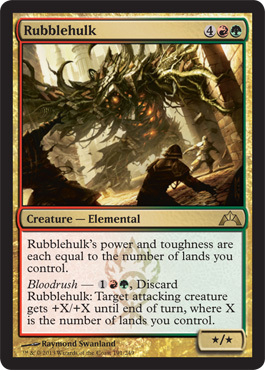 I’ve thought about how Bloodrush affects creature combat extensively. I’ve had whole discussions on the topic, but to no avail. The only conclusion I’ve arrived at is that Bloodrush will be a polarizing force for Gatecrash Limited. Barring the fear of being Giant Growth’d out of the game, opponents will likely either always block or never block. 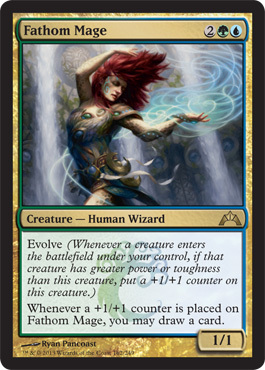 Ones who change their tactics midgame may have a trick to cause the behavior change, are just trying to read you for a particular card, which is exceptionally difficult to do given the range of Bloodrush costs and effects, or just trying to stop you from playing another duder on your turn by forcing you to spend mana in combat. or they could just be mentally flipping a coin in their head, which actually would probably make mapping out your future turns a nightmare. There could be a slight issue with choosing Gruul for the prerelease. I see the ideal Gruul deck having 18+ creatures. It’s likely very rare that any normal sealed pool will be able to build a straight Gruul deck with 18 guys. As a result, Bloodrush’s impact will be diminished a bit because you will often need to commit another creature to the board rather than use it as a trick. The above issue isn’t a real turnoff to choosing Gruul. It has many advantages, especially at a prerelease event. Gruul is very linear, which makes it well suited for an event where you may be playing for Top 8 at 8 am. With Gruul you can just shove your dudes forward while you’re half asleep. The wide array of tricks you could have also may cause opponents to assist you in closing them out by not knowing just how much you could pump your guy and blocking poorly or not at all. I expect to see many players die from 8+ life to a single attacker. This is the guild everyone is all excited about for Standard, and who can blame them. They got the best charm, a sweet X spell, a way to counter an X spell, and some more humans to just maybe make R/W Humans a thing. Limited is a different story however. Boros is in a strange spot in the meta of Limited. 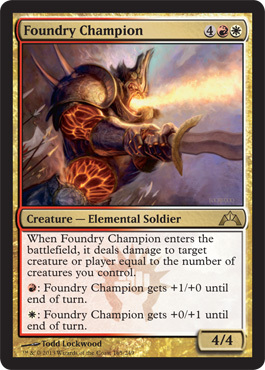 The Battalion mechanic is quite powerful, but it’s presence on many of Boros’ dudes means that without Battalion, their cards are rather weak, and will usually die in combat without help. This means Boros decks are weak to decks that can brawl early and go bigger later to keep up with Battalion triggers. That’s pretty much the definition of both Gruul’s and Simic’s strategies, so be wary when facing off against those guilds. The good news is that leaves two guilds to pick on. Against their strategies that are grindy and not overpowering, you can be the deck that goes biggest. The bad news is that I think Orzhov and Dimir will be the least played of all the guilds, so choose Boros with caution, and open well. They do seem to have a ton of playable cards, so maybe just having a deck with a high density of quality threats is enough to keep pace with Gruul and Simic. Or maybe I’ve just completely misread how these guilds stack up against one another. Guess I’ll find out in about 24 hours. See you all at Gamer’s Gauntlet. Any over/unders on attendance? Last prerelease was over 160! So come on by and play. I’ll be dispensing advice on builds all night whenever I’m not in a round. Only thing I see that I sort of disagree on is that while Boros MAY match up better with Dimir and Orzhov the way you mentioned, both of those guilds play Black, and the black removal in this set seems to be pretty effective in both the common and uncommon slots. In a guild whose main focus is to have 3+ dudes in play most of the time that seems pretty bad to me. The upside to Boros is the power of its rares/mythics/charm and the fact that its promo just flat out beats the others 1v1. Except for maybe the Aberration, but there’s a pretty good possibility you will have enough mana at that point in the game to either trade with it or bump. Just my thoughts.